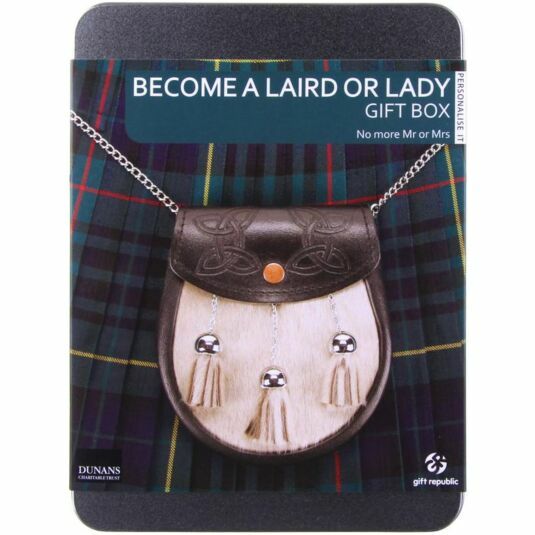 Make someone you know a Laird or Lady! This personalised gift enables you to purchase one square foot of land in the grounds of Dunans Castle, Scotland which entitles you to use the Laird or Lady title for life. If you have always felt you are To the Manor Born or wanted to be a Monarch of the Glen, this is your chance to live the aristocratic life - in name at least! Inside this tin you fill find everything you need to become a Laird or Lady of Dunan. Simply register your gift online or by post and upon registration you will receive a proof of Title card, a certificate confirming your land ownership and further Laird or Lady details. The gift is packaged in a stylish silver tin and would make a lovely memento that will last forever.